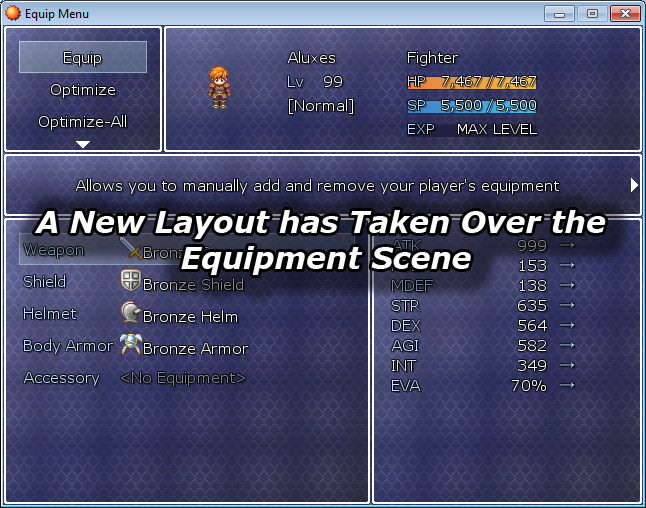 This script essentially redefines the way the equipment system works while keeping the core without rewriting too much. This script changes the equipment scene with a different layout and more efficient methods. Also adds a command window that allows the player to choose from four diffenet methods: Manual, Optimize, Optimize All, & Unequip All. There in the script comment section in the beginning. Scripts that may conflict with this Engine are stated in the comments in the "SECTIONS" and "Script Conflicts and Compatability". This system can still grow, if anyone has any ideals to add to it don’t hesitate to ask. However remember that your ideal might not make it. when you use optimise it automaticaly equips weapons and armors with highest values right? can it be made so that if player makes his character with inteligence and hp that this menu equips those kind of equipment? I'm sure you can make a "case when" to change the optimization requirements based on the character's class name or something like that.